An essential part of the body’s natural healing process, scars are the result of the skin’s repair of wounds caused by accident, disease, or surgical incision. The more the skin is damaged and the longer it takes to heal, the greater the chance of a noticeable scar. A scar’s visibility will depend on a number of factors, including its difference in topography or color from the surrounding normal skin i.e. color, texture, depth, as well as its length, width, direction and location on the body. 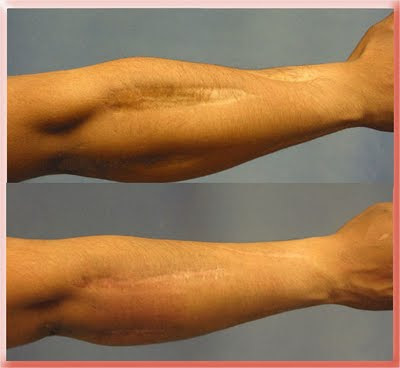 If the skin scar adheres to deeper structures such as muscle or bone the skin may bunch up with animation or movement as it is tethered to deeper structures. The modalities employed to make scars less noticeable include changing scar direction so it lies within a normal skin crease or fold, debulking procedures, scar taping, scar massage, local steroid injection, medical grade skin tatoos (such as tattooing a beard stubble on a man to hide a scar), dermabrasion, collagen injections, chemical peels, cryosurgery, application of a pressure dressing or silastic sheeting, laser treatments and separation of the skin scar from deeper structures. The collective term for these is scar revision, repair, treatment or surgery. Which technique or combination of techniques to apply for the best result requires a qualified trained physician. The required skill set is complimentary to and overlaps with skills required in the performence of cosmetic procedures by plastic surgeons but are not exactly the same. Each patient is different as is his or her scar and mechanism of injury necessitating an individualized approach for each patient. For optimal results the scar revision repair patient may need to be seen on a regular basis for as long as 6 or more months. This patient was injured in a motor vehicle accident. Lip scar tissue removal or scar revision – repair involved removing a wedge of scar tissue and damaged lip and then realigning the lip margins. Although the exact skin condition prior to the inciting injury cannot be reached vast improvement is possible. Scars that lie completely within the area of the lips where women wear lipstick are usually much easier to treat. In this case the scar lump was just removed under local anesthesia. This patient was left with wide depressed scars on his arm after limb saving surgery in another country. The skin could not be sutured at the time and that contributed to the scars. I stretched the adjacent skin with sutures for a month or two using pre-excision suturing before cutting the scars out. That stretched the skin on either side of the scars and allowed me to close the excision sites with less tension thereby decreasing the chance that the scars would widen again. The after photos were taken about a year after surgery. In this case the scar from previous surgery connected the skin to the stomach muscles. The surgery involved separating the deep from the superficial layers and a little bit of liposuction to even the surface contour. The after photo was taken 1 year after surgery. Scar repair or revision can enhance your appearance and your self confidence. Realistic expectations are important to be happy with any surgery. As each patient is an individual, different results can be expected in each patient. There are multiple ways to revise scars including surgical excision, surgical w-plasty, flashlamp laser, fractional laser, application of medicated tape, scar taping, injection of kenalog, application of silicone sheeting, application of pressure garments…. Each scar has a unique appearance, history and location so there is no one size fits all approach. Not all of the mentioned treatment modalities apply to every case. Therefore the best treatment or treatment options are not the same for everyone. The risks of flashlamp or fractional laser, pressure application and silicone sheeting application are minimal although the eyes can be damaged if protective goggles are not worn during laser treatments. The risks of surgical approaches are scar widening, recurrence or infection with recurrence being the most common especially in areas exposed to a lot of motion like the knees. If the scars are symptomatic such is itching, reducing range of motion or interfering with daily activities their treatment and resolution is obviously beneficial. The recovery is dependent on the treatment modality employed. Flashlamp laser and fractional laser recovery can occur over a day they it may take weeks to see the effect of the treatment. Most surgical revisions recover within 10 to 12 days, when the sutures are removed.